The MATLAB Reservoir Simulation Toolbox (MRST) is primarily developed by the Computational Geosciences group in the Department of Mathematics and Cybernetics at SINTEF Digital. However, there are several third-party modules developed by Heriot-Watt University, NTNU, TNO, and TU Delft. Version 2018b was released on the 20th of December 2018, and can be downloaded under the terms of the GNU General Public License (GPL). MRST Core consists of functionality common to many different solvers and tools. Especially, the core includes a fully unstructured grid format, routines for managing and creating petrophysical properties and tools for visualization. MRST is a free open-source software for reservoir modelling and simulation. Like MATLAB, MRST is not primarily a simulator, but is mainly intended as a toolbox for rapid prototyping and demonstration of new simulation methods and modeling concepts. To this end, the toolbox offers a wide range of data structures and computational methods you can easily combine to make your own custom-made modelling and simulation tools. Nonetheless, MRST also offers a quite comprehensive black-oil and compositional reservoir simulator capable of simulating industry-standard models and graphical user interfaces for post-processing simulation results. a large set of add-on modules offering discretizations, solvers, physical models, and a wide variety of simulators and workflow tools. In the modules, you will find many tutorial examples that explain and showcase how the MRST can be used to make general or fit-for-purpose simulators and workflow tools. Using Matlab for reservoir simulation may seem strange at first, but most of the tools and simulators are quite efficient and can be applied to surprisingly large and complex models, including several realistic geological models that are supplied as part of the software. For more computationally challenging cases, we recommend using the open-source OPM Flow simulator from the Open Porous Media initiative. MRST has a large world-wide user base: the last releases each have more than 17.000 unique downloads. If you have questions about the software, we encourage you to visit our user forum, which was launched in June 2016. We normally try to answer your post within a day or two, but sometimes it may take us a bit longer, e.g., during weekends or when we are approaching a deadline in one of the many research projects we run for various clients. K. Bao, K.-A. Lie, O. Møyner, and M. Liu. Fully implicit simulation of polymer flooding with MRST. Comput. Geosci., 2017. DOI: 10.1007/s10596-017-9624-5. Also available from: Springer Nature ShareIt. The user guide gives a general introduction to MRST and simulation of single-phase flow. The user guide is expanded whenever time permits. The first two paper explain how you can use automatic differentiation in combination with a flexible grid format, discrete differential operators, and vectorization in Matlab to develop fully implicit multiphase simulators. This is the modern way of using MRST. 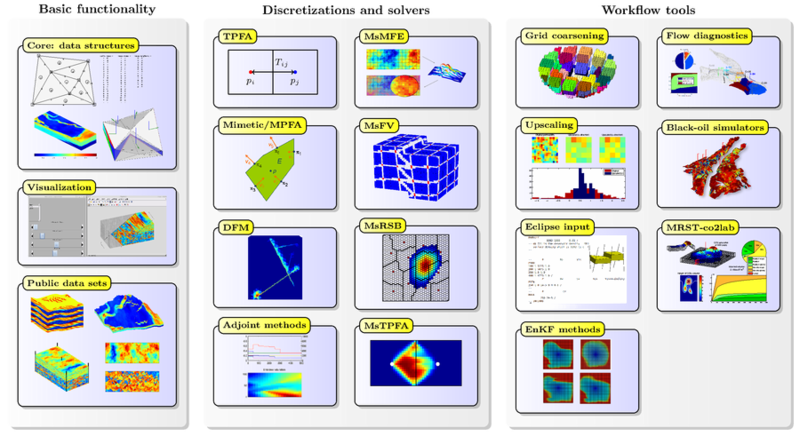 The last paper discusses unstructured grids, discretizations and incompressible solvers, which were the focus during the early development of the software. We also encourage you to look at the many publications that use MRST. This includes almost 130 master and PhD theses and more than 200 journal and proceedings papers written by authors outside of the MRST development team.